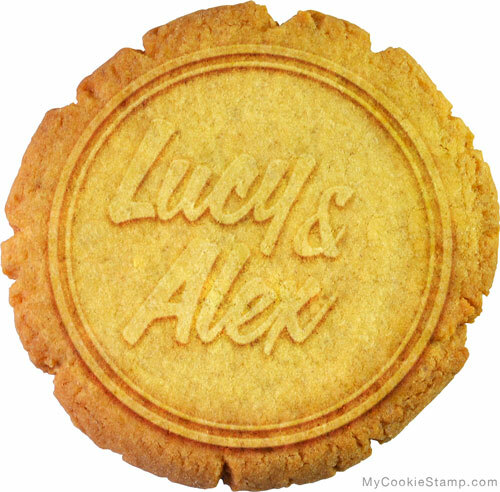 Custom Cookie Stamps with Your Logo. to help you bake unique cookies. Use the "Buy now" button on this page and fill in your address before submitting your payment. You can pay using PayPal as well as all major credit cards. Send us your text or logo and we'll prepare a design proof. If you like it, we'll start the production of the stamp — if not, we'll make one free modification or refund your purchase. You'll receive your custom cookie stamp usually within 21 days from your original purchase. You can use it out of the box with any cookie recipe that doesn't require baking powder. Our cookie molds are made out of food grade durable plastic. The side grip make the stamp very easy to use. 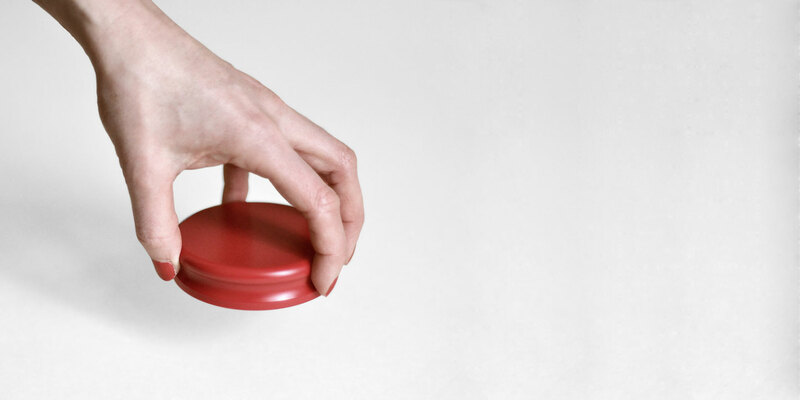 No handle means easy shipping, easy cleaning and easy storing. We are designers and cookie lovers. 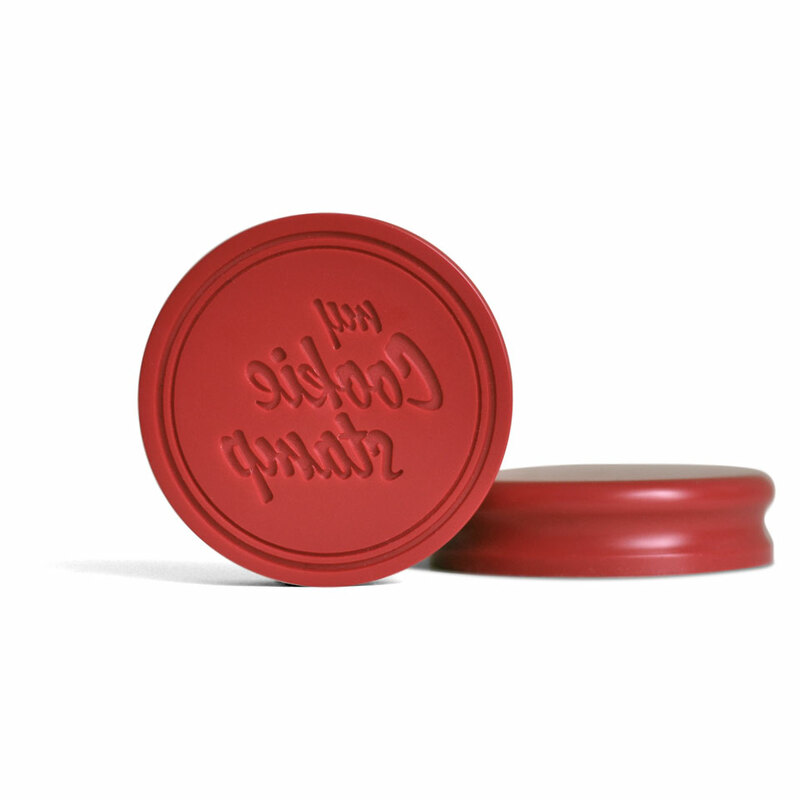 Our stamps are produced with exceptional care and attention. They will fulfill the needs of professional bakeries and serious hobby bakers alike. "It was a birthday gift for my Mum and she was over the moon with it!" "I look forward to ordering more for our marketing!!!" "We’ve looked at the proof and love it!" The size of the stamp is 3" x 3" x 0.75" (8 cm x 8 cm x 2 cm). However the maximum size for your logo is 2.75" x 2.75" (7 cm x 7 cm). We don't offer other sizes at the moment. It's made out of food grade hard plastic. It's the same kind of material that some plastic cutting boards are made of. All our molds are manufactured in Berlin, Germany. We recommend to clean your stamp with dish soap, water and a brush. You'll usually receive your stamp within 21 days of your initial purchase date. However we can't guarantee the delivery date. At this time, we don't offer expedited shipping. Will it work with my logo? Very probably. Simpler logos make for a better imprint on the cookie. If your logo has very thin elements, we'll try to simplify it to get the best result possible. You can have a look at the recipes we recommend here. Most cookie recipes – such as sugar cookies or ginger bread – will work with the stamp as long as they don't require baking powder. A few days after your purchase, you'll receive a digital design proof to review before production. If you don't like it, you can request a modification or ask for your money back. However, due to the custom made nature of the stamp, once it has been produced, we cannot offer a refund – except for the case of a defective item. What shape do you offer? 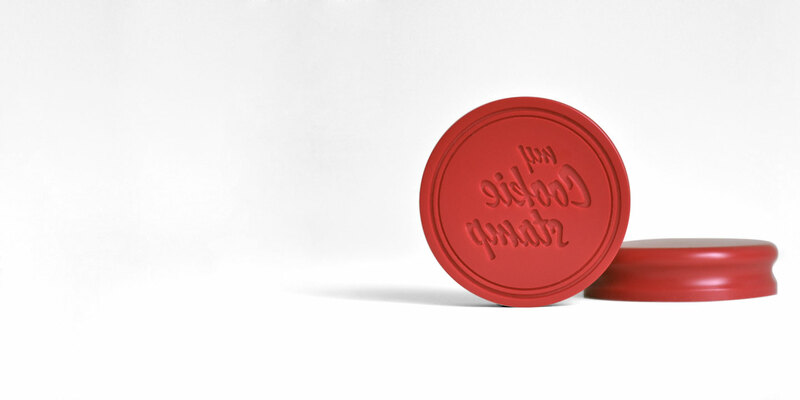 We currently only offer the stamps in a round shape. However, it's possible to engrave any shape on it. You will simply need to use a cookie cutter of the desired shape once you've imprinted the dough… To make square cookies for instance. What's the best format for my logo? You will have the best result with a vectorized logo file (Adobe Illustrator .ai or .eps file). Otherwise, send us any high resolution image file — in black and white if possible. 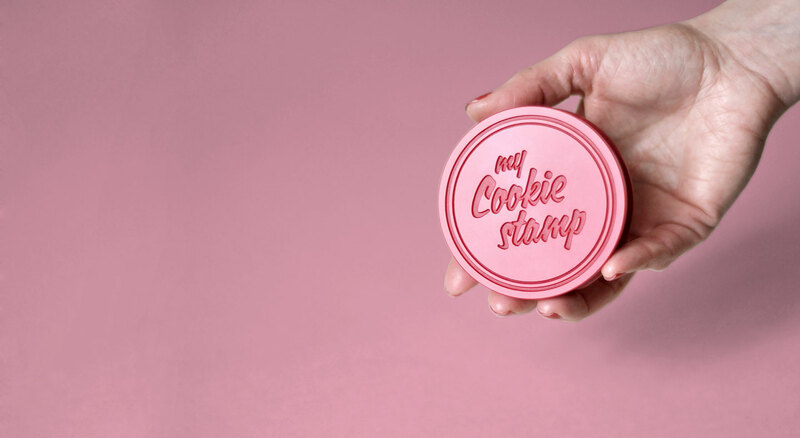 Before using your stamp for the first time, rub flour into the design and lightly tap the stamp on the work surface to release any excess flour. 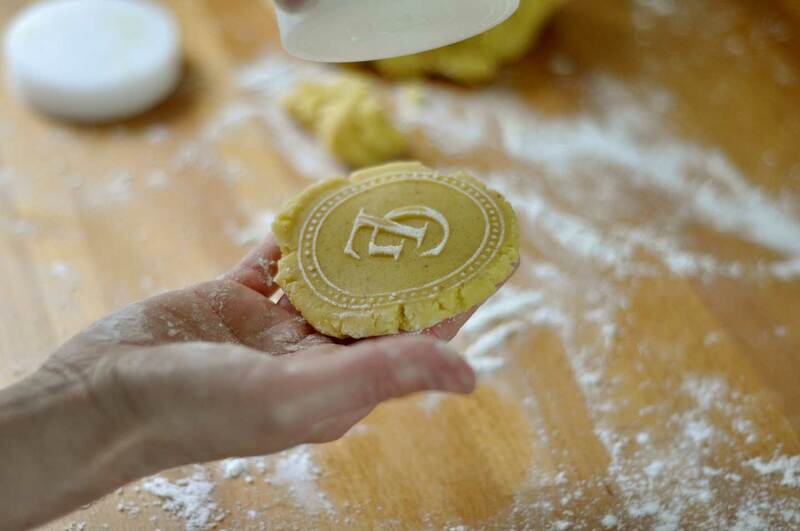 Roll your chilled dough into cookie balls then press the stamp into the dough. Our cookie stamps are made with extreme care to accomodate every specific need. You'll receive a digital design proof to review your stamp before the production. "They look absolutely amazing! Can't wait to give one away to my friend on her birthday." "I thank you greatly for your wonderful, prompt and caring service!" "We just made up a batch of cookies for the company Christmas party, and they look great!" "I absolutely love the workmanship!!"